It’s been a busy past few weeks visiting staff, partners, and clients to validate the Ending Wait Times Project maps. Hearing first-hand from people about their experiences with the child/youth mental health services and referral pathways for CMHA and DCAFS has brought to light many interesting insights. We are excited to be pulling together this feedback and wrapping up this phase of the project. ● A big thanks to staff at the Silvercreek office and DCAFS office who interacted with the large drafts system maps which were on display during the week of March 12. Your feedback was much appreciated! ● Validation sessions with clients and partners across Dufferin-Wellington have continued to provide detailed feedback. We hosted two partner validation sessions in March (one in each region), both of which had great attendance! One-on-one conversations with clients have also offered a way for families to share feedback at a time that works for them. 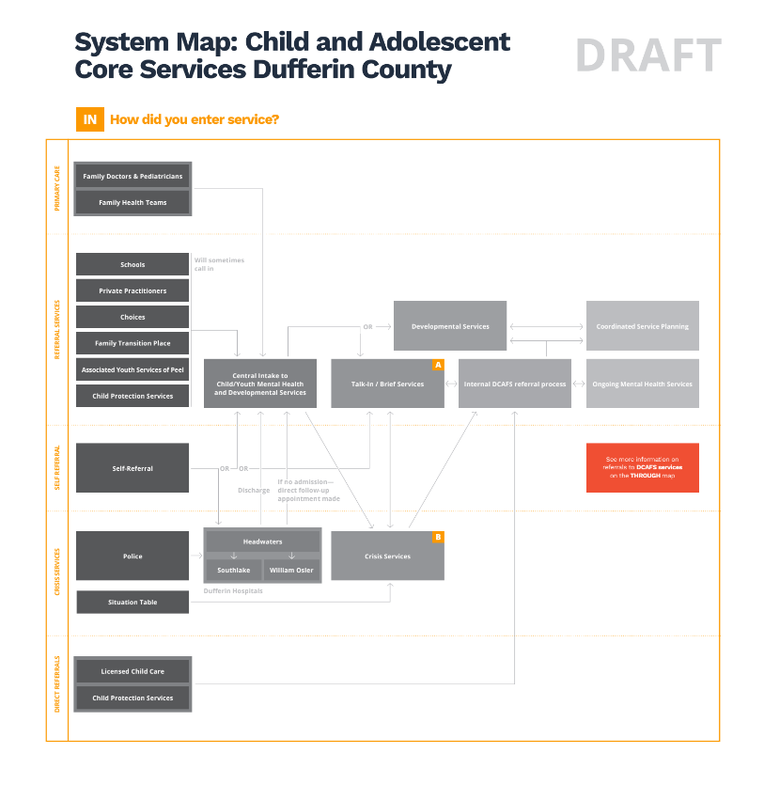 ● Draft maps "in" for Wellington and Dufferin are shown below, to give you a sense of the information that staff, partners and parents were invited to validate. ● We will keep working through all the rich and detailed feedback received from staff, partners, and clients. Revisions to the maps are ongoing, and a final report summarizing what we have learned during this phase of the project is in progress. ● The Moving on Mental Health Operations Committee met on March 27 to hear an update on this phase of the work and discuss the main themes from mapping and validation. Together, we also began ideating on what the future state of the system might look like without wait times. ● Mapping and validation are just the beginning! The next phase of the project will focus on identifying processes that can be improved to reduce wait times. For questions or to learn more please contact Heather Callum, Systems Coordinator for Child/Youth Mental Health at hcallum@cmhaww.ca or 226-979-6060. Older PostON TO THE NEXT PHASE...FROM MAPPING TO VALIDATION!